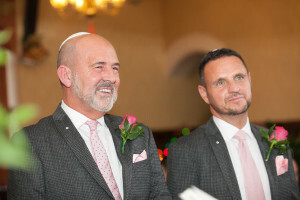 Is it possible to have a gay Jewish Wedding? It most certainly is possible and I would be honoured to help you work out the right ceremony for you. Also, I can help with a gay interfaith wedding. If you want a Jewish wedding, then you can exchange rings under the chuppah. You can have your own Ketubah read out, I can sing the seven blessings and you can break the glass. Please arrange to meet with me so that we can go into more detail and add your own character to your ceremony. Please contact me using the form below and I would be delighted to help you plan your wedding.